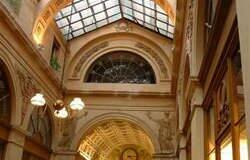 Between the Palais Royal and Les Halles on the right bank of Paris you will find the "passages couvert". These fascinating galleries and covered arcades with their tall iron work and glass roofs, hand carved woodwork, wrought iron gas lanterns and mosaic or marble floors date back to Paris's heyday of the mid 1800's. It was an era of promenading on the grand boulevards, dance halls, theatre, luxury boutiques and the first restaurants. At the height of their popularity there were 150 such "passages couvert", today however, there are less than 20. Each has its own characters and personality from elegant and polished to shabby and laid-back and are full of boutiques, speciality shops, antique and book stores and many wonderful sights and reminders of days past. and the nearby Gallerie Colbert.